Roundwood Halt was opened on 8th August 1927 to cater for a housing development at Harpenden during its expansion as a London 'dormitory own' (for commuters). It had a single short concrete platform in the cutting on the west side of the line with a timber waiting shelter. 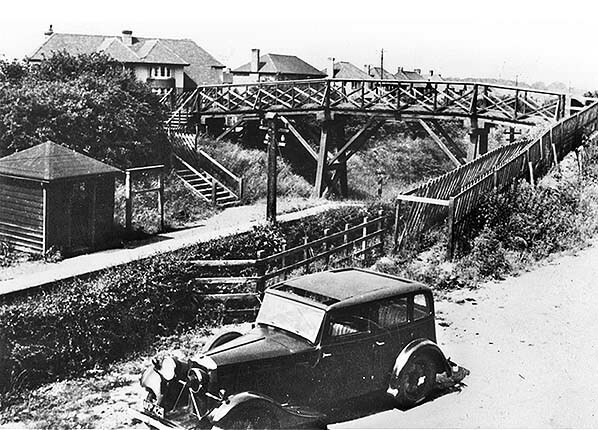 A timber footbridge had been built across the cutting in 1926, this was later replaced by a tubular metal bridge in 1957. Access to the station was by wooden steps from Park Hill which ran parallel with the line at this point. The halt never had any goods facilities or sidings but there was a yellow single arm lower quadrant type fixed signal at the south end of the platform. During conversion of the line to a footpath in the mid 1980s the north end of the platform was buried under a ramp up to road level to give public access to the line at this point. The wooden waiting room now stands in a nearby garden. Click here to read John Wyborn's account of the daily commute from Roundwood Halt. The first proposal for a more convenient rail link for the people of Hemel Hempstead was presented in 1862 by John Grover. His proposal was for a short spur from the main line to the lower end of the (old) town at Bury Mill End. At the same meeting, another more ambitious proposal was put forward, extending the line through Redbourn to link to the Great Northern Railway at Harpenden. However, Grover's design found a sponsor and following an Act of Parliament in 1863 the Hemel Hempstead and London & North Western Railway Company was formed to construct and operate the line. 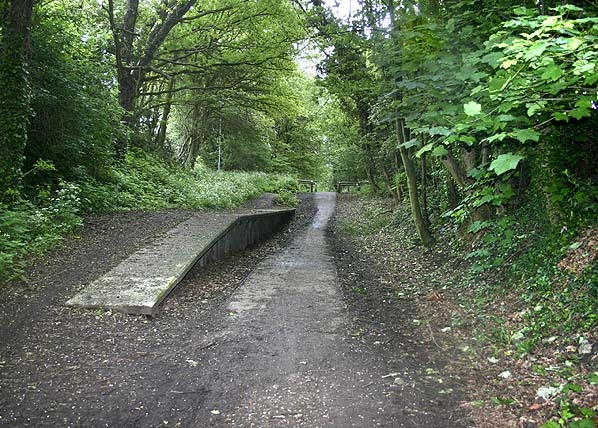 However, no construction work was undertaken due to difficulties with local landowners and problems agreeing the connection to the main line at Boxmoor and after a number of years of stagnation the earlier proposals were re-examined. Parliamentary approval was obtained in 1866 and construction work began. Construction prceded extremely slowly, the lower spur from Boxmoor to Hemel Hempstead only being completed by 1871, though the connection to Boxmoor was via an awkward turntable. The Hemel Hempstead Railway was absorbed by the Midland Railway in 1886. The straw plait trade declined, and in order to help the line pay its way the junction at Harpenden was realigned so that it headed south instead of north and trains now ran into a new bay platform at Harpenden. The new platform opened in July 1888 with seven trains a day, most with a direct connection to St. Pancras and one through train to St. Albans. The 9am train from St. Pancras 'slipped' a coach at Harpenden to run onto the branch. 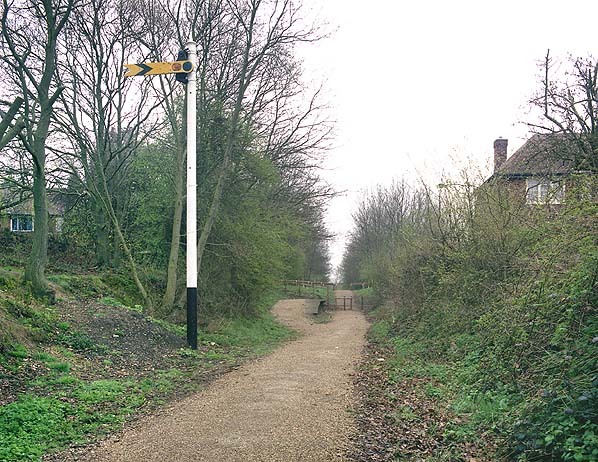 Beaumont's Halt, Redbourn & Harpenden. 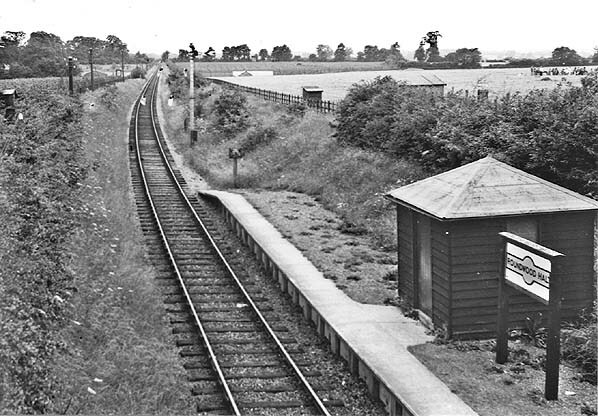 Roundwood Halt seen from Moreton End Lane in 1942. 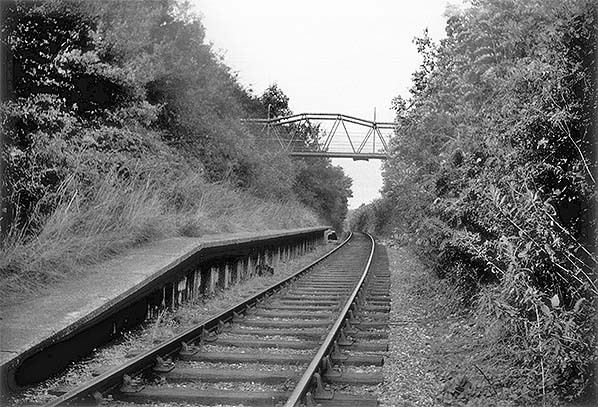 The moriginal timber footbridge across the line is seen, thos was replaced by the tubular metal bridge seen below in 1957. 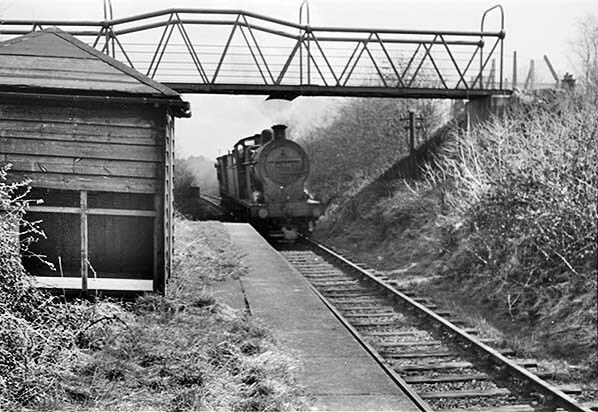 The halt is still open at this date, the name board had been removed as a wartime measure in an attempt to confuse the enemy after an invasion. The has also been modified for war time use with white wheelarch/mudguard tips and one masked headlamp. The other, unmasked, headlamp will have had its bulb removed. The car was first registered in Kent in December 1933. A southbound ex-LMS Fowler 4F 0-6-0 pulls through the disused Roundwood Halt in April 1955. 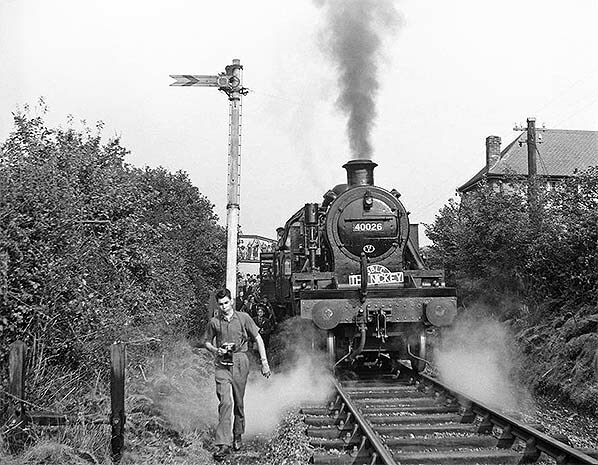 The South Beds Loco Club's Nickey Railtour stands at Roundwood Halt on 24 September 1960 on the outwards journey of the tour from Harpenden Cantral to Hemel Hempsted and back. Enthusiasts are seen standing on the platform and on the bridge linking Patk Hill with Moreton End Lane. 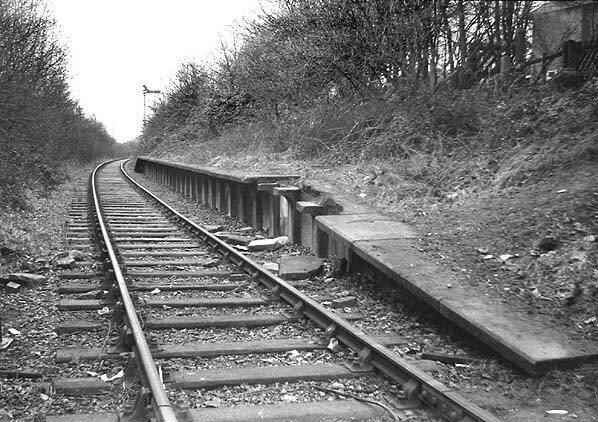 Roundwood Halt looking north east in May 1982, shortly after the track was lifted. Roundwood Halt looking north east in November 1984 shortly before the line was officially opened as a footpath and cycleway. 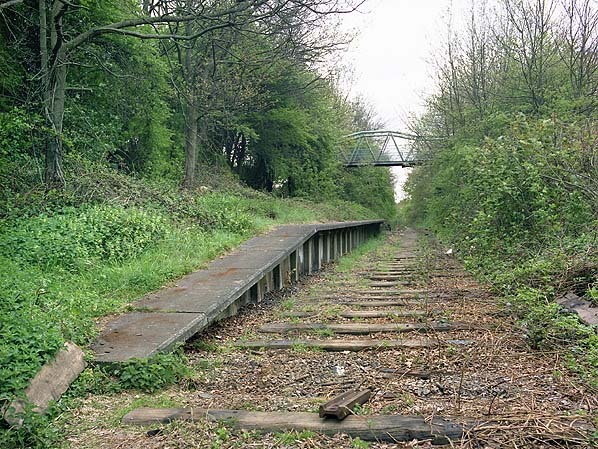 Roundwood Halt looking north east in May 2005. The far end of the platform has been buried to to create a ramp to bring the footpath up to road level for access.